With Sundew, you provide their spambot web spider with thousands of verifiable email addresses that are completely bogus. This ends up in their database and as a minimum, increases the number of bounces they generate - even if they use the usual trick of having a no subject-line, no body-content email. If you have a tarpit, such as SMTarPit, it slows everything down as well. As Sundew produces a set of static web pages, you can use this on a Windows system as well as UNIX-like systems such as Linux. With SMTarPit, their poisoned email address lists get clogged up with connections that take a long time to process. If we are lucky, we can have them arrested and prosecuted as well because the tarpit produces a long-duration connection that has a particular fingerprint that can create a paper trail. Now, there is also a monitor program (CLI version [which can run on a teletype if you really want] and a GUI version) so that you can keep an eye on what is going on. 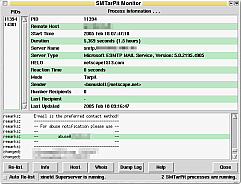 Note that you do not need to run either of the monitor programs or even a GUI to run SMTarPit. With TarPop, we can keep crackers busy so that we can learn something about them and whilst we are learning, they are not on the streets, mugging old ladies.